Should you use views (in particular, as opposed to writing the more powerful stored procedures)? This page will concentrate on the good side of views - we'll consider the disadvantages in the next part of this blog. If the above sounds like a recommendation to avoid using views, it's anything but - the first advantage trumps all of the disadvantages. Whether you're writing views in SSMS or creating reports in SSRS, you can always use a view in place of a table. Link a few tables together to get the studio, language, country and certificate for each film. Apply a filter so that you only see Spielberg films. Apologies for using the * to include all columns from the films table - you might want to be pickier than this, and specify exactly which columns the view should list. I think this data predates Schindler's List. Sorry, Steven! I don't know how many times I've stressed to people on our SQL courses the importance of creating views as above to avoid reinventing wheels for every query that you create. 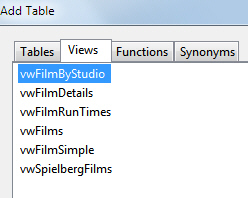 One thing to stress: the query above will also rerun the vwSpielbergFilms view to get the latest version of the data. If speed is a big issue for you, you'll probably want to consider creating temporary tables of data instead. Your IT department may be deeply reluctant to give you permission to create stored procedures, but they may give you the right to create views (since these can only ever select data). That ends the case for the defence; time now to look at the case for the prosecution!